When decorating your living room, it would be really good to have matching sets instead of a colourful room with many different accessories. This is to prevent your home from looking messy, untidy and disorganised. Matching accessories can make your home look more organised, welcoming and comfortable. Try to combine things like your curtains or blinds with your sofa. What about your room painting with a small rug in the middle of your living room? You know how it is: one day, you walk into your living room, guest room or office, clap eyes on that clapped-out sofa, and you think: enough’s enough! That shabby, saggy piece of furniture has got to go. So, what should you be looking for in your new sofa? Naturally, something stylish; but you should also consider the practical side of such a major purchase. Is the fabric hard-wearing? Is it easy to clean? Upholstery buyer Pamela Taylor has this invaluable advice on choosing the perfect sofa that will offer you lasting style and comfort. Choose a sofa accordingly that will suit your lifestyle and needs, and take advice from an experienced sales consultant who can help narrow down your choices to ranges that are suitable. Aspects that are particular important about choosing the right sofa is the covering of the upholstery (leather or fabric), the style (pillow back or casual back) and the cushion interiors (fibre, feather or foam). If you are interested in cleaning services for your furniture, such as upholstery, you may want to look at is That Carpet Guy for more information. Leather is hard wearing and if you get a corrected grain it is easy to look after. Dust weekly with a clean, soft colourless cloth (which you mustn’t use to clean anything else) If you do need to clean anything off do so with a little pre boiled water cooled to room temperature and USE VERY SPARINGLY. Do not use spray polish or detergents. If the leather is semi aniline or Aniline then you must not get it wet and should use a specialized cream cleaner. For this reason these lathers are not as easy to look after (although they look great and have a great handle). Fabric is also pretty hard wearing although it does stain easier than leather. Dust and dirt fall on our upholstery just as much as they do on our tables and chairs and it can cause fabrics to prematurely wear and fade. This can be avoided by careful brushing with a soft brush, then vacuuming using the correct attachment – usually on a weekly basis. Velvets and Chenille’s feel fabulous but can flatten with use and they should definitely be vacuumed and brushed regularly – but always in the direction of the pile. Unless you have washable loose covers it is always advisable to get a professional to do any major cleaning. With accidents and spills, always act quickly. Do not rub, soak or allow the stain to set in. Absorb the spillage in a clean white absorbent cloth and do not use washing up liquid or detergents. If you want to use specialist upholstery cleaner, it is advisable to test first on a hidden area. When considering what style you want, keep in mind that sofas with pillow backs need more “dressing” (i.e. tidying) than classic backs so if you find that sort of thing tiring or have a house full of children then a classic back would be more suitable for you. Choosing the right interiors are crucial and the far the easiest option to look after is foam. You will need to turn regularly and rotate where possible overall foam is your best bet. However, many of us love the comfort and softness of fibre but these cushions do require some work on a regular basis. A light plumping just does not work with fibre as you need to tease out the fibres to retain look and comfort. If you don’t look after these cushions properly, you will lose about 20% of their loft in the first 6-8 weeks!! Another important aspect to consider is getting the right size and shape sofa for your home. For example, if you have to put it in the corner of a small room, you should measure the exact amount of space you have reserved for it. Additionally, you should also measure the width of your door to make sure the sofa can fit through it and ensure that the space you put your sofa in compliments the size of your sofa whether small or large (e.g. 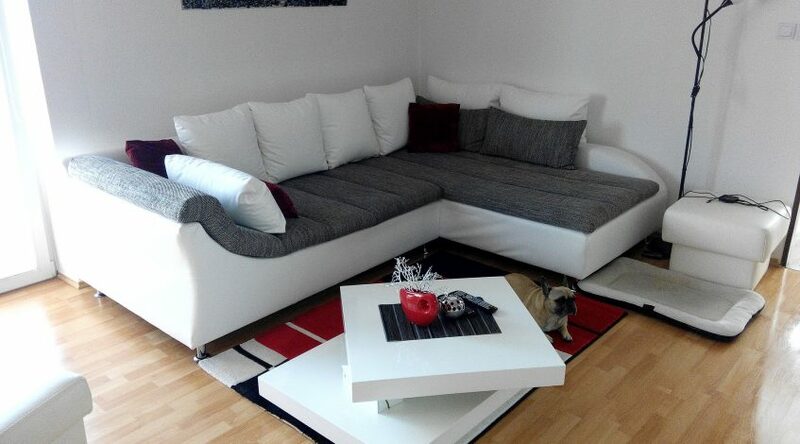 a smaller sofa for a smaller room or bedroom and a large sofa when you have more space to fill). Take these tips on board, get shopping and in no time at all that tatty old sofa that’s currently cluttering up your room will be where it belongs – on a skip. Meanwhile, you’ll be enjoying your fabulous new purchase: a sofa that combines great looks with practicality, that’s just as hard-wearing and reliably comfortable as it is stylish. After all, why compromise? As a savvy shopper, you really can turn this major purchase into a long-term interiors investment that will continue to enhance your home for years to come.